SCOTTSDALE (KMJ) — President Donald Trump has signed a presidential memorandum which promises to ultimately bring more water into the Central Valley. The directive given to the Departments of Interior and Commerce is designed to streamline the regulatory process, develop a timeline for completion, expedite environmental reviews, and convene experts, to ultimately deliver more supply from federal water projects. That includes the California State Water Project and the Central Valley Project. 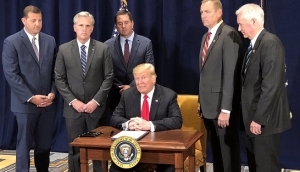 “This is a big day for the Central Valley of California,” began President Trump as he sat down Friday to sign the document, surrounded by Congressmen David Valadao, Tom McClintock, Jeff Denham, Kevin McCarthy, and Devin Nunes. “I want to thank everybody for being here and this is a vital action, in my opinion vital, to improve access to water in the American west. What’s happened there is disgraceful. They’ve taken it away. “There’s so much water they don’t know what to do with it and they send it out to sea. For decades, burdensome federal regulations have made it extremely difficult and expensive to build and maintain federal water projects. “Millions of Americans in the West depend on critical water infrastructure to irrigate farmland, provide water and power, and support our economy. Some of the best farmland in the world, by the way, can’t be used because they don’t have water. But they actually have a lot of water. At the ceremony in Scottsdale, President Trump said that his executive order would remove all unnecessary burdens and speed up the environmental review and approval process. The Departments of Interior and Commerce have been told to expedite their biological opinions for the Central Valley Project and California State Water Project, Klamath Irrigation Project in Oregon, and the Federal Columbia River System. The presidential memorandum will direct the Secretaries of Interior and Commerce present their biological opinions for the Central Valley Project and California State Water Project before the end of June 2019. The White House adds that the memorandum will ensure that protections under the Endangered Species Act will not be compromised.